Lent is a forty day journey made by the Christian community to help each member re-invigorate the longing for God. Originally associated with the preparation for Baptism, today the focus is on our preparation for the celebration of the greatest feast in the Christian calendar – Easter – where every Christian renews the baptismal commitment. 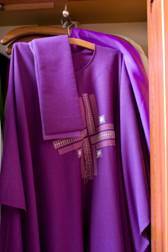 Lent is an annual retreat for the members of the Christian community. It is an opportunity to revisit or uncover the core truths of the Christian life and the individual’s longing for God. It is reflected in prayer, fasting and giving. In our Parish, we make time to gather as a community in prayer and reflection with our neighbouring Christian churches through the “Lenten talk series”. We have a special celebration of the sacrament of reconciliation during mass on one Sunday during Lent. We participate in the Trócaire Lenten programme. Prior to Lent we make resolutions as individuals and a community. We make choices to take on new things and abstain from others. We participate in all of the Lenten liturgies from Ash Wednesday until Holy Week. ‘Through asking we prepare, we live the moment through prayer and through alms giving we share’.